U.S. president Barack Obama entered office with a bold plan to combat Afghanistan's escalating insurgency, empower its government, encourage a political resolution of the conflict, and secure the cooperation of neighboring Pakistan—all in time for U.S. troops to withdraw by the end of 2014. 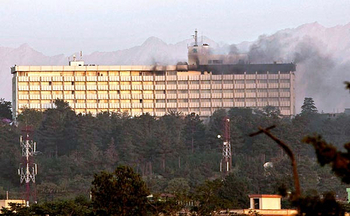 The increasing boldness and lethality of the Haqqani network can be illustrated by the June 2011 assault on the Intercontinental Hotel in Kabul that left eleven civilians and two Afghan policemen dead, and the September raid on the U.S. embassy in Kabul that killed more than a dozen people. This new Afghanistan-Pakistan (AfPak) policy has yet to deliver on its promise. While the U.S. military surge swept insurgents out of their southeastern strongholds, the rebels have responded with terror attacks and assassinations reaching into the heart of Kabul. Washington has accelerated its training of Afghan security forces, but most U.S. aid still circumvents the central government, weakening its authority. With a political settlement nowhere in sight and Pakistani support for armed extremists unabated, Washington's options for preventing a Taliban takeover have narrowed. Until the September 11, 2001 terror attacks left nearly 3,000 Americans dead, Afghanistan was not a high priority for U.S. policymakers. After aiding the Afghan mujahideen in their struggle to expel Soviet occupation forces in the 1980s, Washington disengaged from the country in the 1990s, effectively outsourcing it to Pakistan and Saudi Arabia. The Taliban, a militant Afghan, Islamist group, captured Kabul in 1996 and set about establishing a brutally repressive theocracy. The governments of Iran, Russia, and India supported the anti-Taliban Northern Alliance, which held on to northeastern Afghanistan. Though fueled by competing regional ambitions, the war was fought largely along ethnic lines. The Taliban was dominated by Pashtuns, the largest ethnic group in Afghanistan (42 percent of the population) and the second largest in Pakistan while the Northern Alliance was dominated by Tajiks (27 percent), Uzbeks, (9 percent), and various smaller minorities. Even as Osama bin Laden's al-Qaeda network began concentrating the main focus of its activities in Afghanistan in the late 1990s, Washington refused to aid the Northern Alliance, relying instead on Islamabad to address U.S. concerns. After 9/11, a U.S.-led international coalition joined forces with the Northern Alliance to overthrow the Taliban. President George W. Bush resolved not only to deprive al-Qaeda of a safe haven in Afghanistan but also to establish a liberal, democratic state that would serve as a model for the Islamic world. In addition, Afghanistan was seen as an ideal, strategic platform to combat terrorist threats emanating from the region and to keep a watchful eye on influence from Russia, Iran, and Pakistan. A stable Afghanistan was expected to resume its traditional role as an interregional trade corridor, providing access to Central Asian markets and energy resources. Washington treated any and all who violently resisted the government of President Hamid Karzai as one and the same enemy. The Bush administration's ambitious goals in Afghanistan were greatly under-resourced. The training and deployment of Afghan security forces was soon outstripped by the growing power of the Taliban and other Islamist groups in remote areas of Pakistan, now the epicenter of global jihadist terror. This compelled the U.S.-led International Security Assistance Force (ISAF) to fight a counterinsurgency campaign with little input from the Afghan people, many of whom came to believe they were being deprived of control over their own destiny. Despite a steady increase in the size of the ISAF, by 2009, the Taliban had established shadow governments in most provinces with officials collecting taxes, conscripting young men into the Taliban army, and holding trials to punish criminals and resolve civil disputes. The prospect that Afghanistan could fall back into the hands of the Taliban was never greater. In a March 2009 speech, President Obama announced a new AfPak policy with a narrow focus: "to disrupt, dismantle, and defeat al-Qaeda in Afghanistan and Pakistan and to prevent their return to either country in the future." Further declaring Afghanistan to be not just a U.S. problem but "an international security challenge of the highest order," the president pledged to work multilaterally with international institutions, U.S. European allies, and Afghanistan's neighbors. Although publicly framed as a counterterrorism strategy, the new AfPak policy represented a classic counterinsurgency strategy viewing nation-building and democratization as prerequisites to military success. Claiming that Afghanistan was "denied the resources that it demands because of the war in Iraq," Obama greatly boosted U.S. troop deployments in Afghanistan and increased military and economic aid. Confident that the U.S. military would achieve its objectives in eighteen months, he pledged to begin withdrawing troops in July 2011 and complete the hand-over of security to Afghan military and police forces in 2014. While committed to defeating the uncompromising core of the Taliban with force, Washington was now eager to promote a political settlement and prepared to offer "carrots" to those willing to give up the fight. Obama emphasized that the process must be spearheaded by the Afghan people and their government without foreign interference. The president recognized that the Taliban and its militant allies were primarily based not in Afghanistan but in remote areas of the Pakistani frontier, which he called "the most dangerous place in the world." Pakistan would get increased military and economic assistance in return for restraining its Afghan proxies. Shortly after taking office, Obama began increasing the U.S. military deployment in Afghanistan with the aim of reversing Taliban gains and strengthening the capacity of Kabul's own security forces to take over the fight. In February 2009, he ordered 17,000 more troops to Afghanistan. In March 2009, he ordered the dispatch of 4,000 additional troops to accelerate the training of Afghan security forces. After internal policy reviews concluded that the ISAF was not strong enough to stabilize the country and win the war, in December 2009, the president announced that he was sending some 30,000 more U.S. troops. By early 2011, the ISAF had reached a peak strength of 150,000 troops, two-thirds of them Americans. The surge succeeded in clearing Taliban forces from areas of Afghanistan where they had grown strong, particularly the provinces of Kandahar and Helmand, and in establishing at least nominal government authority there. However, this came at the expense of inflaming popular resentment toward the ISAF in the affected local communities. The broader purpose of the surge was to draw insurgents to the negotiating table and win Pakistani acceptance of the status quo. Yet by setting a fixed deadline for the withdrawal of U.S. troops without affirming any strategic commitment to Afghanistan after 2014, the administration gave rejectionists an incentive to wait out the storm rather than compromise. Political necessity led Obama to proceed on schedule with his commitment to begin pulling out troops in June 2011, further reinforcing the Taliban's reported unofficial slogan, "Americans have the watches; we have the time." Even as U.S.-led coalition forces took the fight to the Taliban, the Obama administration worked to encourage dialogue with insurgent leaders willing to renounce violence. Though collectively referenced as "the Taliban" in many Western media reports, there are three distinct Pashtun networks leading the Afghan insurgency, all of which have sanctuaries and training facilities in Pakistan. None have been placed on the U.S. State Department's official list of foreign terrorist organizations as this would imply Islamabad's designation as a sponsor of terrorism and potentially discourage it from reaching an accommodation with Karzai. The Taliban, led by Mullah Omar and the Shura council in Quetta. The Haqqani network, led by former mujahideen leader Jalaluddin Haqqani and his sons, based in North Waziristan. The network has maintained close ties to the Taliban since the latter's capture of Kabul in 1996 but often operates independently. Both groups have officially maintained that no negotiations can take place until all foreign troops leave Afghanistan. Hizb-e-Islami, led by ex-mujahideen leader Gulbuddin Hekmatyar. Hekmatyar ran afoul of the Taliban in the 1990s and moved to Iran but joined forces with Mullah Omar after U.S.-led forces entered Afghanistan in 2001. He is less beholden to Omar than the Haqqanis and more amenable to compromise. Indeed, a splinter group of Hizb-e-Islami sympathetic to Hekmatyar is represented in the Afghan parliament and holds a seat in Karzai's cabinet. Reconciliation efforts by Karzai fall into three distinct tracks. The first is a long-running attempt to co-opt individual Taliban members, often through financial inducements. By the time Obama came into office, more than 6,000 Taliban members had already defected, including at least nineteen former officials of the 1996-2001 Taliban regime, most notably former foreign minister Wakil Ahmad Muttawakil and former ambassador to Pakistan Mullah Abdul Salam Zaeef. While some of these defectors helped build local tribal support for the government, most were no longer active in the Taliban after 2001 and have since been officially disavowed. A parallel effort was made to peel away the Haqqani network and Hizb-e-Islami from Mullah Omar. Efforts by Karzai and Washington to woo the Haqqanis date back to at least 2004 while back channel overtures to Hekmatyar were underway in 2008. Both have been offered political spoils (high-level cabinet seats, local governorships, and the like) in exchange for pulling their fighters out of the insurgent camp, but neither has accepted. The third track—still in its infancy when Obama entered office—comprises efforts to reconcile with Omar himself, which would effectively end the insurgency altogether. Officially, the Taliban maintains that it will not negotiate until all foreign troops have left Afghanistan while Karzai maintains that the Taliban must accept Afghanistan's constitution. Unofficially, both Karzai and Omar have signaled the willingness to compromise on their bottom line positions. In 2008, exploratory contacts between emissaries of Karzai and Omar were held in Saudi Arabia. In January 2010, Karzai set up a National Council for Peace, headed by former president Burhanuddin Rabbani, charged with brokering a political compromise. The choice of Rabbani—a Tajik who fiercely resisted the Taliban's takeover of Afghanistan in the 1990s—to take charge of outreach to mainly Pashtun insurgents was intended to placate Karzai's non-Pashtun coalition partners from the Northern Alliance, who fear that he or Washington will cut a deal with the Taliban at their expense. Karzai's greatest difficulty in reaching out to the Taliban is that he is not in a position to deliver what it wants. Most high value Taliban detainees are held in U.S. detention facilities outside the control of the Afghan government. Mullah Omar is also said to be eager to see the removal of Taliban leaders from the list of the U.N.'s al-Qaeda and Taliban Sanctions Committee as a confidence-building measure, but Karzai has no control over this. As Karzai sought to reach an accommodation with the Taliban, U.S. and European officials initiated their own contacts. The U.N. special representative in Afghanistan, Norwegian diplomat Kai Eide, met with regional commanders from the Quetta Shura in Dubai in January 2010. Mid-ranking State Department and CIA officials reportedly held two secret meetings with emissaries of Mullah Omar, including his relative Tayyab Agha, in the winter of 2010-11 and May 2011. There were also reports that some U.S. officials met with representatives of the Haqqani network. Karzai was angered by the Obama administration's back channel talks with the Taliban, which he saw as undercutting the authority of his government. In June 2011, the Afghan president leaked details of the contacts to the media, forcing Agha (who had apparently not informed the Pakistanis of his outreach) to break off the talks and go into hiding. However, while lack of coordination between Kabul and Washington probably undermined their reconciliation initiatives, it soon became evident that Islamabad constitutes the main obstacle to a breakthrough. President Obama came to office with no illusions about the Pakistani government's continuing sponsorship of insurgent forces in Afghanistan. Just months earlier, Washington intercepted communications indicating that officers of Pakistan's Directorate for Inter-Services Intelligence (ISI) were behind the bombing of the Indian embassy in Kabul. Although some U.S. congressmen and analysts began publicly accusing Pakistan of collaborating with the Taliban and al-Qaeda, administration officials held back. There was a widespread recognition in Washington that victory in Afghanistan would ultimately depend on coaxing Islamabad into curtailing militant Islamist networks operating on its territory. Toward this end, Washington greatly increased military and economic assistance to Pakistan, the latter tripling to $1.5 billion annually. The new aid was intended to develop the economy of remote areas where militant groups operate and to encourage the Pakistani government to curtail them (indeed, the enabling legislation nominally requires it). In the meantime, the Obama administration was prepared to act unilaterally against terrorist threats in Pakistan. The number of U.S. drone attacks on targets in the country increased dramatically, from 33 in 2008 to 118 in 2010. In May 2011, a Jalalabad-based U.S. strike force raided bin Laden's compound in Abbottabad, killing the al-Qaeda leader. The Pakistani authorities were not notified beforehand as the close proximity of bin Laden's residence to the prestigious Kakul military academy strongly suggested official collusion in hiding him. However, the Pakistani government has little incentive either to stop militant groups from organizing and training on Pakistani soil or to accept an Afghan political settlement that will strengthen the central government in Kabul. Indeed, Islamabad has not only refused to encourage compromise but has reportedly pressured moderate Taliban leaders not to pursue a political accommodation with Karzai. According to Eide, the arrests of the Taliban military commander, Abdul Ghani Baradar, and a dozen or so other senior Taliban figures by the Pakistani authorities in early 2010 brought an end to his contacts. The spring and summer of 2011 witnessed a wave of spectacular attacks in Kabul and assassinations of high profile government officials, mostly by the Haqqani network. In June, the Haqqani network carried out an assault on the Intercontinental Hotel in Kabul that left eleven civilians and two Afghan policemen dead. In September, it carried out a truck bombing of a NATO outpost south of Kabul that killed five coalition soldiers and wounded seventy-seven; it also staged a raid on the U.S. embassy in Kabul that killed more than a dozen people. According to U.S. officials, the embassy attackers were in cell phone contact with suspected ISI operatives. Later that month, Karzai's hopes of a national reconciliation were shattered when a suicide bomber posing as a Taliban envoy assassinated High Peace Council chairman Rabbani. The Pakistanis are "using terrorism as a tool against Afghanistan," the president warned afterward. After the killing of Rabbani, Karzai announced that he was calling off peace talks to focus instead on bringing Pakistan to the negotiating table. "The Taliban will not be able to move a finger without Pakistani support," he explained before embarking on a two-day visit to India where he signed major security and development agreements. The Obama administration has continued to ratchet up pressure on Islamabad. "The United States will never tolerate a safe haven for those who aim to kill us," the president warned in June 2011. The following month the administration decided to suspend or cancel about a third of the more than $1.5 billion in annual security assistance it provides to Pakistan. Secretary of State Hillary Clinton and CIA chief David Petraeus have met with their Pakistani counterparts to press for Islamabad to change course. On September 22, Adm. Mike Mullen, chairman of the Joint Chiefs of Staff, described the Haqqani network as "a veritable arm" of Pakistan's ISI, an unprecedented official acknowledgement of its direct role in killing U.S. soldiers. Nevertheless, it appears unlikely that Islamabad will yield to Washington's demands. Washington provided Afghanistan with $51.8 billion in aid from 2002 to 2010. Roughly 56 percent of this went to the training and equipping of Afghan forces while the remainder was allocated to economic, humanitarian, governance, and counter-narcotics programs. Because of Afghanistan's devastation during the preceding decades of war and repressive Taliban rule, most nonmilitary aid has been allocated to building civil infrastructure and providing basic services, rather than developing the productive capacity of the Afghan economy. The rationale is that building roads, clinics, and schools has the short-term effect of winning hearts and minds. Though international aid has unquestionably improved the lives of many Afghans, the assumption that this alone can erode support for the Taliban was unfounded. "What we've found is that it is generally not the case that a lack of schools or roads drives conflict," Rajiv Shah, U.S. Agency for International Development (USAID) administrator, said in January 2011. "Too much aid seeks to achieve rapid material results without sufficiently promoting local ownership, sustainable poverty reduction, or longer-term capacity building," according to Oxfam, a leading aid and development charity. For example, the international community has neglected Afghanistan's agricultural sector. Of the $4.4 billion spent by USAID from 2002 to 2006, just 5 percent was allocated to agriculture-related projects. This figure fell to 4 percent in 2007 and 2008. Industry has been virtually ignored. Recent geological surveys have found that Afghanistan has extraordinarily rich mineral deposits (particularly iron, copper, cobalt, gold, and lithium) estimated to be worth up to $3 trillion, but they have barely been exploited. To make matters worse, the large majority of U.S. and international aid has been "off-budget" in that it goes directly to foreign contractors, nongovernmental organizations (NGOs), and provincial reconstruction teams, not the government. While this has provided "more financial and programmatic control to the donor," a Senate Foreign Relations Committee staff report later concluded, it has also served to "weaken the ability of the Afghan state to control resources." In effect, donors have created a parallel administration that is more involved in the lives of many ordinary Afghans than the actual government, greatly undermining Karzai's authority and fueling the perception among Afghans that decisions for their country are being made by others. The Afghan government finds it nearly impossible to retain competent workers when foreign governments, aid agencies, nongovernmental organizations, and private companies offer them inflated salaries and benefits… sometimes 10 to 20 times the amount of base government salaries, to perform jobs within Afghan Government institutions. For similar reasons, Karzai has crusaded against the heavy reliance of foreign NGOs and governments on private security contractors, saying that it is "preventing the growth and the development of the Afghan security forces." Proponents of bypassing the government typically point to rampant corruption in Afghanistan, which was ranked the third most corrupt country in the world by Transparency International in 2010. Obama has pressed Karzai to stamp out graft to little avail. In the summer of 2011, "a grim, unpublicized assessment" by U.S. officials concluded that no substantive action was being taken by Karzai to prosecute corruption. However, much of the corruption in Afghanistan derives from patronage networks that were entrenched as a result of U.S. collusion with the Northern Alliance in 2001-02. While Karzai has his own patronage network, so, too, do a number of Tajik and Uzbek warlords, particularly in the security forces (it is estimated that around two-thirds of the army's battalion commanders are Tajik). This has a far more corrosive impact on public perceptions than the president's excesses. According to Selig S. Harrison, "The psychological cement that holds the disparate Taliban factions together is opposition to Tajik dominance in Kabul," something that the Afghan president can do little about. Bypassing the central government does little to avoid corruption and misuse of power and resources. On the contrary, a 2010 U.N. study found that corruption is highest in rural areas and lowest in big cities where the government is strong. Foreign contractors and NGOs have been known to pay off local warlords and insurgents to ensure safe passage in remote areas. Intelligence consultant Joshua Foust has argued that channeling more aid through the government is "better for the long-term health of Afghanistan, even if it contributes to aggregate corruption." As Alex de Waal of the Social Science Research Council has shown, patronage systems can be a force for stability and conflict management in states with weak formal governing institutions as they facilitate "elite buy-ins." Patronage is deeply rooted in Afghanistan where people have long expected political leaders to distribute fruits of power to their relatives and followers. According to the above-mentioned U.N. study, 38 percent of Afghans believe it is legitimate for a government official to ask for a "present," and 42 percent think nepotism is acceptable. When official institutions are distrusted, argues de Waal, patronage can be the most reliable way of resolving disputes and dispensing resources. The common mantra that combating corruption is "as important a priority as actually fighting insurgents" must, therefore, be qualified. Reducing corruption without undermining political stability requires a long process of institutional reform. Still, some progress has been made in the areas of public financial management in Afghanistan. The Obama administration may have begun to recognize that aid should be allocated and distributed primarily with an eye toward strengthening the Afghan state, not circumventing it. The percentage of U.S. aid that is on-budget has risen steadily from 21 percent in fiscal year (FY) 2009 to 35 percent in FY 2010 and 37-45 percent in FY 2011. At the July 2010 Kabul conference, the United States and other international donors agreed to channel 50 percent of aid through the government. Unless Washington manages to achieve a diplomatic breakthrough with Islamabad, a negotiated end to the insurgency in Afghanistan is highly unlikely. Without a political settlement, few expect that the Afghan government will be capable of maintaining control of the country on its own for the foreseeable future. Even if it could, the cost of sustaining the projected size of the Afghan military and police forces in 2014 is estimated to run between $6 billion and $8 billion. Although the Obama administration has publicly maintained that it has no interest in "permanent bases" in Afghanistan, it has held several rounds of talks with Afghan officials to hammer out a strategic partnership agreement providing for the indefinite deployment of 20,000 to 30,000 U.S. troops after 2014. However, progress has stalled over a host of Afghan demands. Karzai wants the agreement to have the legal force and stipulations of a treaty between two sovereign states. For example, he insists that the U.S. military must relinquish detention facilities it operates and refrain from carrying out raids on neighboring states from Afghan territory. While Kabul needs a long-term, strategic partnership with Washington if it is to have any hope of blunting intervention by predatory neighbors, Karzai has resisted U.S. pressure to abandon his demand for full recognition of Afghan sovereignty. In a country that prides itself on having been the "graveyard of empires," accepting the permanent presence of foreign troops on Afghan soil without explicit sovereignty guarantees would be a major political liability for Karzai and doom his efforts to draw popular support away from the Taliban. The Afghan president has found it politically necessary to denounce ISAF forces from time to time, particularly in the wake of civilian casualties from NATO airstrikes. If the Obama administration wants to succeed in Afghanistan, it must focus on consolidating the powers of the central Kabul government and disrupting efforts by foreign powers to weaken and destabilize it. If Afghans are given the opportunity to peacefully resolve their differences free of outside interference, they will. None of the ethnic groups in the country have strong separatist ambitions and all have a rich, if episodic, history of uniting together in the face of common perils. However, true dialogue cannot succeed until Afghan sovereignty is restored. Wahabuddin Ra'ees is associate professor in the department of political science and deputy dean, co-curricular activity, Student Affairs and Development Division of the International Islamic University of Malaysia. Ahmed Rashid, Descent into Chaos: The United States and the Failure of Nation Building in Pakistan, Afghanistan, and Central Asia (London: Viking Penguin Books, 2008), pp. 3-4, 11, 20. "Country Profile: Afghanistan," Library of Congress, Federal Research Division, Washington, D.C., Aug. 2008. Rashid, Descent into Chaos, pp. 24-31; "Afghanistan: Are We Losing the Peace?" Independent Task Force Report, Council on Foreign Relations and the Asia Society, Washington, D.C., June 2003, p. 7. The Washington Post, Dec. 8, 2009. Barack Obama, remarks on a strategy for Afghanistan and Pakistan, White House, Washington, D.C., Mar. 27, 2009. Barack Obama, "The Way Forward in Afghanistan and Pakistan," U.S. Military Academy, West Point, New York, Dec. 1, 2009. NBC News, MSNBC, May 23, 2007. The Washington Post, July 5, 2007; The New York Times, Mar. 11, 2009. Asia Times (Hong Kong), May 5, 2004. The Washington Post, Nov. 5, 2008. YNet News (Tel Aviv), Dec. 3, 2009; Pakistan Today (Lahore), Aug. 6, 2011. NBC News, MSNBC, Oct. 6, 2008; Reuters, Feb. 2, 2010. Max Boot, "Karzai's Risky Moves with India," Commentary, Oct. 6, 2011; Ahmad Majidyar, "Afghan President Karzai Suspends Taliban Talks," AEI Center for Defense Studies, Washington, D.C., Oct. 6, 2011. The Guardian (London), Jan. 28, 2010. Der Spiegel (Hamburg), May 24, 2011. Associated Press, Aug. 29, 2011. Ahmed Rashid, Taliban: Militant Islam, Oil and Fundamentalism in Central Asia (New Haven and London: Yale University Press, 2000), pp. 17-30; idem, Descent into Chaos, p. 9. The New York Times, Sept. 22, 2011. The Wall Street Journal, May 3, 2011; "Aid to Pakistan by the Numbers," Center for Global Development, Washington D.C., accessed Dec. 13, 2011. The Economic Times (Mumbai), Nov. 18, 2011. "The Year of the Drone," New American Foundation, Counterterrorism Strategy Initiative, Washington, D.C., Nov. 16, 2011. The New York Times, May 1, 2011. The Guardian, Mar. 18, 2010. The Long War Journal (Washington, D.C.), Sept. 3, 2011. The New York Times, Sept. 22, 24, 2011. Al-Jazeera TV (Doha), Oct. 8, 2011. Barack Obama, "The Way Forward in Afghanistan," White House, Washington, D.C., June 22, 2011. Curt Tarnoff, "Afghanistan: U.S. Foreign Assistance," Congressional Research Service, Washington, D.C., Aug.12, 2010, p. 12. Rajiv Shah, "Insights," USAID Frontlines, Dec. 2010/Jan. 2011. "Ten Point Plan to Change Course in Afghanistan," Oxfam, Washington, D.C., Jan. 31, 2009. "Nourishing Afghanistan's Agricultural Sector," The Council on Foreign Relations, Washington, D.C., May 26, 2009. The New York Times, June 13, 2010. "Evaluating U.S. Foreign Assistance to Afghanistan," Committee on Foreign Relations, United States Senate, Washington, D.C., June 8, 2011, pp. 18-9. Milan Vaishnav, "Afghanistan: The Chimera of the 'Light Footprint,'" in Robert C. Orr, ed., Winning the Peace: An American Strategy for Post-Conflict Reconstruction (Washington, D.C: Center for Strategic and International Studies, 2004), p. 251. "Evaluating U.S. Foreign Assistance to Afghanistan," p. 22. The New York Times, Aug. 23, 2010. Corruption Perception Index 2010 Results, Transparency International, Berlin, accessed Dec. 13, 2011. Associated Press, Oct. 11, 2011. Selig S. Harrison, "Afghanistan's Tyranny of the Minority," The New York Times, Aug. 16, 2009. Spiegel Online (Hamburg), Jan. 19, 2010. The Washington Post, Dec. 17, 2009, Oct. 8, 2010. Joshua Foust, "Actually, Karzai Is Right about PRTs," Foreign Policy, Feb. 8, 2011. Alex de Waal, "Fixing the Political Market Place: How Can We Make Peace without Functioning State Institutions?" The Chr. Michelsen Lecture, 2009, Bergen, Nor., Jan. 20, 2010. Spiegel Online, Jan. 19, 2010. De Waal, "Fixing the Political Market Place." The Wall Street Journal, June 25, 2010. Rashid, Descent into Chaos, pp. LIV, 171-218, 403. "New ARTF Grant," The World Bank, Washington, D.C., Aug. 9, 2011. "Evaluating U.S. Foreign Assistance to Afghanistan," p. 19. BBC News, July 20, 2010. "Evaluating U.S. Foreign Assistance to Afghanistan," p. 25. The Telegraph (London), May 10, 2011; The Fiscal Times (New York), Oct. 20, 2011. Aryn Baker, "For the U.S. to Leave Afghanistan, It Has to Be Ready to Stay," Time Magazine, Sept. 13, 2011. The New York Times, June 19, 2011. Related Topics: Central Asia, US policy | Spring 2012 MEQ receive the latest by email: subscribe to the free mef mailing list This text may be reposted or forwarded so long as it is presented as an integral whole with complete and accurate information provided about its author, date, place of publication, and original URL.